Earlier this year, KT Tape launched the industry’s first synthetic kinesiology tape, and they’re calling it a game changer. And, with rave reviews already coming in from tape-savvy athletes, they might just be right. During the 30+ years that kinesiology tape has existed, very little has changed other than cosmetics such as color, size and tape configuration (rolls, strips or precut). 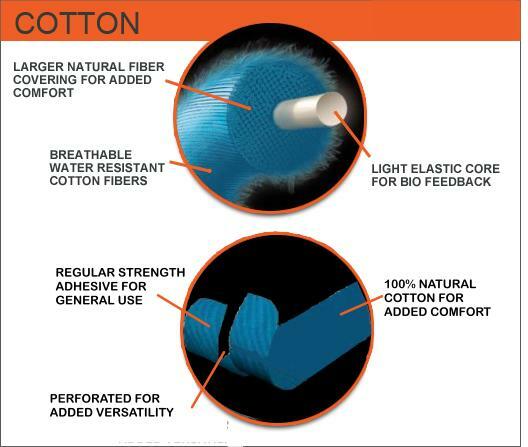 Industry leaders, Kinesio Tape, KT Tape, SpiderTech, RockTape and PerformTex, have always made their tape from 100% cotton with an acrylic adhesive. KT Tape’s radical move to introduce KT Tape Pro, a synthetic kinesiology tape has caught the attention of both athletes and clinicians worldwide. 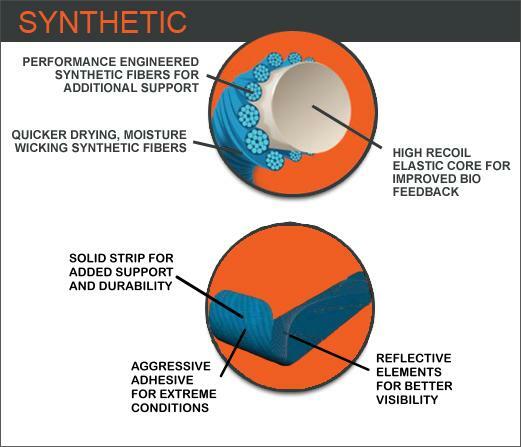 What makes synthetic tape different from cotton? it’s waterproof and dries in a flash after swimming, showering, etc. it’s drop dead gorgeous! The colors are amazing! The cross sectional images below show the difference between synthetic and cotton KT Tape. KT Tape Pro comes in 16′ rolls, each containing 20 precut, ready-to-apply 10″ strips. In addition to basic beige and black, you can buy KT Tape Pro in 6 other stunning colors – laser blue, winner green, blaze orange, epic pink, hero pink and solar yellow. You can also buy synthetic KT Tape in 125′ uncut bulk rolls in beige or black.